(Alexandria Egypt) Students from the University of Alexandria, march in the streets of Alexandria to stop corruption in the University Campus. Students are demanding the purge of the old guards of Mubarak, 8 months after the thrown out of the Dictator Mubarack the University was still running with the old rules of repression and oppression of the students. The release of the protesters, the bloggers, the journalist and any person that was arrested during the Egyptian Revolution. 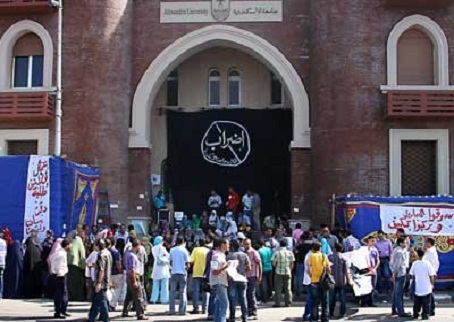 The students protesting in front of the Building of the University of Alexandria, have very specific demands: End of The Corruption at The University. Omar Shalaby: “You should say that I am protesting for the corruption in the University here at Alexandria. Hend Hanafy takes 250 000 LE every month, we want to fire all the Managers of the University, the old Mubarak guards. Omar Shalaby, we are receiving many threatens to be killed, but we are here like one hand. yeah very bad things, just pray for us. Nine months later the population is taking to the streets again, the situation have not changed in Egypt, the Dictator is gone, but the Tyrannical rule of the all Tyrant still in place. The Mubarak undercover Elite police paid and trained by the US, was to blame for the criminal and inhumane practices exerted in the population, the many cases of torture and the disappearing of opposition leaders, the economic oppression that was asphyxiating Egypt all thought to be gone with Mubarack but as the past and no real change is seeing, the people knowing the power they have, they will be taking to the streets again. In an Attempt to curved the growing resistant to the new military regime, the interim forces in power instituted a curfew in Cairo, but the people do not care for old practices of repression and they are taking to the streets again. Omar Shalaby: We are not afraid, (my friend Omar tells me that they are not afraid of be shown in the News, he wants their message to be known by the whole world). Marivel Guzman; Better Education, more budget? Omar Shalaby; Our University was from the best 100 Universities all over the world, now it is out, now we do not even meet higher education standards. We have genius that finish in Alexandria University but they do not have, good changes to get a well paid job. Marivel Guzman; I hear that before. How Sad. 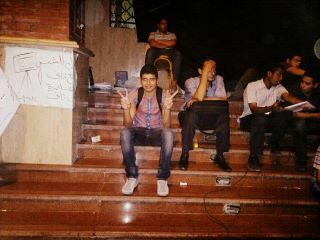 Omar Shalaby: Yeah, mention this point as well, No Corruption in Alexandria University. The protests have not really stopped since the ending of the Egyptian Revolution, we can say that the Revolution has not be won yet, Mubarak is gone, but Egyptian wants all his rules, all his practices, all his Men, OUT, they want a new Egypt, fresh born out of the Revolution. The people that offered martyrdom for a better future for Egypt, they need to be honored with a New Egyptian Society, free of all Corruption. The official numbers talk of close to 1000 deaths, but having known the practices of Mubarack Secret Elite Police, they talk of the Thousands Disappear right at the beginning of the Revolution. So the people want all the thugs of the old regime out. There is no other way they will continue, the protests will continue, there are talks of Tahir Square to be Occupied Again. The Following Statement is found in the Web Site of the University. Even thought that it sound all Nice and call to restrain, which I advice also, the Non Violent Movement is most important. But also lets not forget that this same people are part of the Old Mubarak Regime and they still have in place the same oppressive tactics against the student body of the University. Egypt is now going through a crisis, the language of wisdom and reason prevail over the language of feelings to prevent disturbance and unrest. Greetings to Egypt’s conscious, promising, intellectual, esteemed, and committed youth, which calls for the right to a dignified life in all measures, a legitimate right of the people of this beloved homeland for a secure and stable life, bearing in mind the security and safety of the country under the discipline that govern all individuals without distinction between race or religion, protected by our armed forces which proved their respect and appreciation to the legitimate demands of the people of the nation. We call on our young people, conscious of the intellectual investment pros of this situation to maintain the security of this nation and the stability of the belief that this is their homeland and that they are the future and the main sponsor of the country. God save this nation. God save Egypt. It was ranked between the best 100 Universities, but is not the case any more, the Students Protest also want to help their University to back in the rank they enjoin before, and only after all the University is clean up of all the corruption that is part of its history for the past 30 years. Share The Message to the world, they want to be Free to study, to have the educational tools that they deserve. Egypt being so rich country it has the means to provide the University with all the resources a Institution of this Importance should have. To allow the students to have their students bodies and to be managed by the students, without cohortion from the University Director. Peaceful demonstrations have always prove to be part of any changes, and they want to be Free to exercise their rights to free speech and demonstrate. The youth is the future of any Nation, they have the capacity of decide, to plan, to revolt if is needed, to protest when needed, the youth is the most smart and capable cell of any society and should not be oppressed or repressed, and the youth is the bigger cell in ANY Nation of the World. We should honor them, and respect them, they are our hopes for better future.